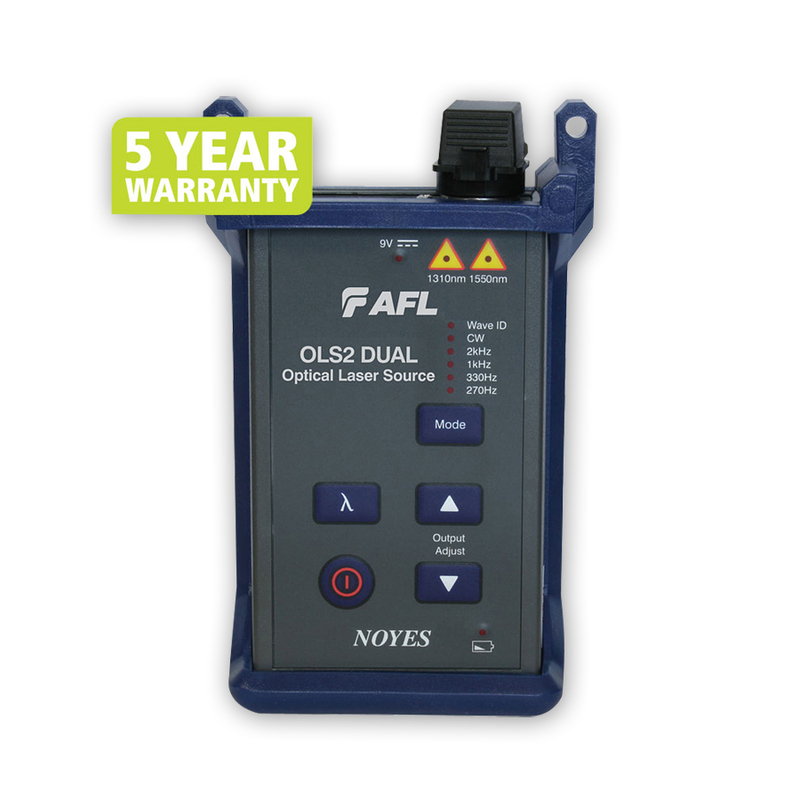 NOYES OLS2 - Dual from AFL is a hand-held, rugged laser source designed for performing insertion loss measurements on single-mode fiber optic links when used with an optical power meter. The LASER output is stabilized to ensure accurate test results per current TIA/EIA requirements. Equipped with industry standard 2khz test tone, the OLS2-Dual from AFL is an ideal tool to pair with an optical fiber identifier (OFI-200D) for use in fiber identification. Single-mode output port emits 1310/1550 nm LASER output at CW, WaveID, dual wavelength WaveID, or user selectable Tone. Faster Test Times with WaveID – In WaveID mode, the NOYES OLS2-Dual encodes each wavelength with a unique WaveID code. When used with a NOYES power meter, the pair can send and receive two wavelengths each test – doubling testing efficiency – reducing test time! Flexible Output Connector Adapter Design – The OLS2-Dual output port is equipped with UCI based removable adapters to allow the output connectors to be inspected and cleaned, while allowing field change of output style between FC, SC, ST, and LC connector adapters. The OLS2-Dual is fully N.I.S.T. traceable.